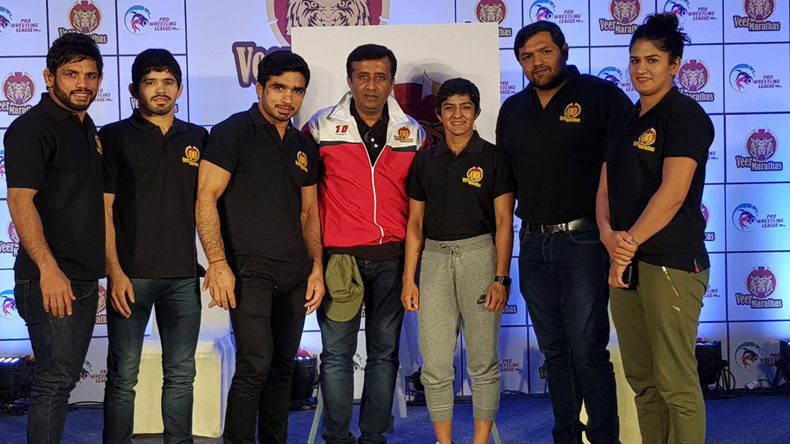 The Veer Marathas will be spearheaded by three-time bronze medallist and current silver medal holder from the World Championships Vasilisa Marzaliuk, 2016 Rio Olympics bronze medalist Marwa Amri and India’s own 2017 Commonwealth Wrestling Championship silver medalist Parveen Rana. The star-studded line-up of Marathas will face their nemesis tonight at 6PM when they take on last year’s runners-up Haryana Hammers. After the third season of Pro Wrestling League 2018 got off to a sensational start last night with Mumbai Maharathi registering their first win of the campaign by defeating Delhi Sultans with a thumping 5-2 margin, Veer Marathas will take on Haryana Hammers today in the second tie at Delhi’s Siri Fort Sports Complex. The Veer Marathas will be spearheaded by three-time bronze medallist and current silver medal holder from the World Championships Vasilisa Marzaliuk, 2016 Rio Olympics bronze medalist Marwa Amri and India’s own 2017 Commonwealth Wrestling Championship silver medalist Parveen Rana. The star-studded line-up of Marathas will face their nemesis tonight at 6PM when they take on last year’s runners-up Haryana Hammers. When and where will the Pro Wrestling League match between Veer Marathas and Haryana Hammers get underway? The Pro wrestling League match between Veer Marathas and Haryana Hammers will start on January 10 at 6PM. All the league games and the knock -out encounters will be played at the Siri Fort Complex in New Delhi. How to watch Pro Wrestling League season 3 live match between Veer Marathas and Haryana Hammers? The Pro Wrestling League season 3 match between Veer Marathas and Haryana Hammers will be telecasted live on Sony Max, SONY ESPN and SONY ESPN HD. When and what time Veer Marathas vs Haryana Hammers will start? The Pro Wrestling League action will be live on each day from the 9th to 23rd January, 2018. The match toss will take place at 6:50 and action will begin from 7:00 pm every day.